Thanks for checking out my fundraiser page. I have just completed my seventh solo record – NAMASTE – and you can help me put it out. Let me say first that a lot of people have already been kind to me this year because I was in a horrendous car accident June 12th and missed a lot of work, and people (perhaps you) have been very generous to me already. I gave that money to my wife Beth, because that's what smart husbands do, and she's all about making it last until I'm well enough to work full-time again. Using the money to release a record was not really ever in consideration. So if you've already given, I thank you wholeheartedly for even considering giving again. Four things are already paid for – the recording, mastering, photography and cover design. That's all done. Now, the question is... do I just raise enough money to press copies and hand them out to my friends and sell them at gigs, or do I go all out and have a proper indie release, with a press agent and radio promoter. I want to go all out, because, If you don't do those promotional things, nobody outside of your closest fan base will ever know you put a record out. Pressing the record will run me about $4000, radio can run to $4500 and a three month press campaign will be approximately $7000. So that’s $15500. Level One: $25 to $50 – An autographed (if you wish) copy of NAMASTE the day it is released, plus a free digital download of the record. Level Two: $51 to $100 – An autographed copy of NAMASTE, digital download and a Tommy Womack NAMASTE T-shirt. Level Three: $101 to $250 – The record, the shirt and a copy of one of my books, either Cheese Chronicles or The Lavender Boys & Elsie. 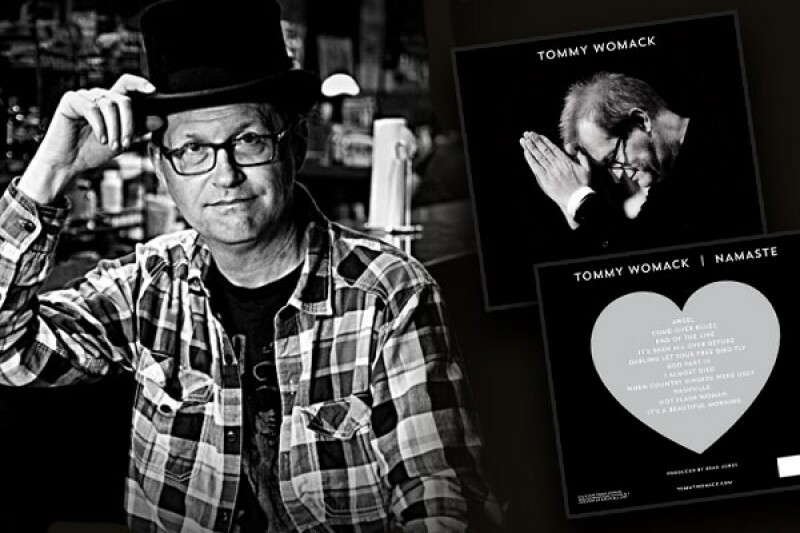 Level Four: $251 to $500 – The record, the shirt, the book, and the handwritten lyrics of the Tommy Womack song of your choice, on acid-free paper and suitable for framing. Level Five: $501 to $1000 – The record, the shirt, and YOUR OWN SONG, written to order and recorded by me! You tell me what you want the song to be about – your spouse, your dog, your first kiss, whatever - and I write it, perform it, and record it, just for you. Level Six: $1001 to $1500 – The record, the shirt, your choice of the aforementioned items, and your name in the record liner notes credited as Executive Producer. I appreciate your help more than I can ever say. NAMASTE means, “the spirit in me salutes the spirit in you.” Thank you and God bless. 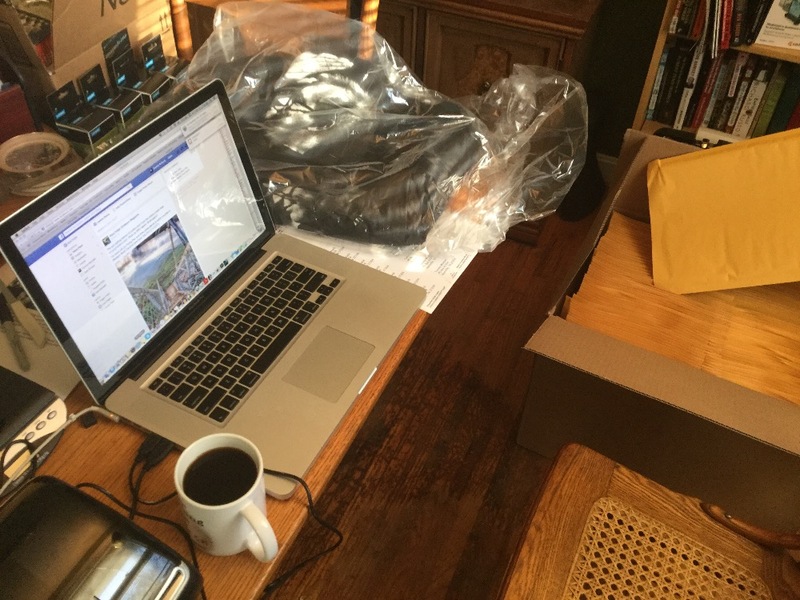 A bag of NAMASTE T-shirts, a box of large envelopes, the postage meter, the scale, the MacBook, and, importantly, coffee. Ah, the joys of crowdfunding! Have a great weekend everybody! Would love and autographed copy. Is this vinyl or CD? Would prefer vinyl. Many Thanks anyway sharing your talent with us, Tommy. You make me laugh. Love ya Tommy! We can't wait to see you next month at SGHR.